Fake Progress Bar lets you define any custom message that you want to display along with the progress bar, like, “Wait for a few minutes till your computer is updated”. The message will come in pop-up with progress bar. Fake Progress Bar also gives you option to show dual progress bars. In that case, you can show a main message with the first progress bar, and you can define another set of custom messages to come with the second progress bar. The software is really sweet, and cool to have. If you would like to have some free time in your office, this software might come handy. 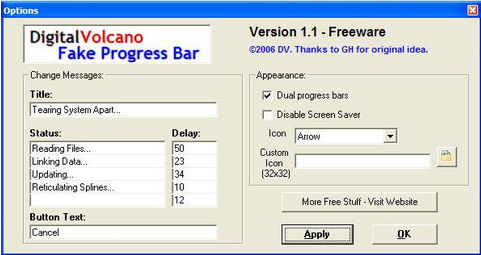 Fake Progress Bar is a very interesting free software. It makes your computer look busy by showing a fake progress bar with a custom defined message. This will come handy when you basically do not want to work on your computer, and make it look like as if your computer is busy doing something. Pretty cool. The software is really sweet, and cool to have. If you would like to have some free time in your office, this software might come handy. Download using links at the end.